Good morning, readers! Are you ready for Day 2 of Nature Week with The Digit-al Dozen? I’ve done leopard print nail art many times, but this is the first time I’ve tried to match the colors and base to an actual leopard. With the help of 2 different Simple Designs tutorials from Idiot’s Guides: Nail Art by Emily The Lacquerologist, I am quite happy with how this nature-inspired mani turned out! For my base design, I followed the Simple Gradient tutorial from Emily’s book, found on pages 54-55. I started with a base of OPI Alpine Snow and let dry. Once the gradient was blended nicely and dry, I followed the Leopard I tutorial from Emily’s book, found on pages 36-37. I dipped my dotting tool into a puddle of OPI Ice-bergers & Fries and made irregularly shaped spots on the nails. I then dipped the same dotting tool into a puddle of OPI Who Are You Calling Bossy?!? and created wavy outlines of the spots. C shapes, 2 bumpy lines on either side of the spot, etc. I filled in some of the empty spaces with dots and swipes of OPI Who Are You Calling Bossy?!? using the dotting tool. KBShimmer Clearly On Top was used to seal it in. What do you think? Do you have a polish color like the one I had to mix for the leopard base fur? This isn’t the first time I’ve done this to get the “right” color I have in mind, and it helps if you don’t have a huge polish collection. I just find it easier to do if you are using it for nail art or sponging it on, rather than trying to paint it onto the nails as a full color. Idiot’s Guides: Nail Art is available now on Amazon in paperback or Kindle edition! I highly recommend it! *Idiot’s Guides: Nail Art was a previously reviewed press sample, all opinions are my own. *There are affiliate links in this post, which means that I get compensation if you click through and purchase. Thanks so much for reading! Take a look at what the rest of the Digit-al Dozen ladies did for Day 2 of Nature Week below. Great job!! It looks very realisic! I have never done realistic either, now I want to do it asap! I love my margarine containers too for this. It's perfect, especially with the gradient! I'm going to have to try a freehand leopard print one day. I use cottage cheese lids. I eat so much more cottage cheese since I started doing nail art, haha! This is so pretty! I'm a sucker for leopard anyway but I love this faded natural look! Gorgeous! I haven't done a freehand leopard but have done a couple stamping ones! I think the gradient adds so much to these prints! Very nice manicure! Like it a lot! These are so pretty – I love the realistic color combo you chose to use! This looks amazing! I love that you used lovely gradient as your base. 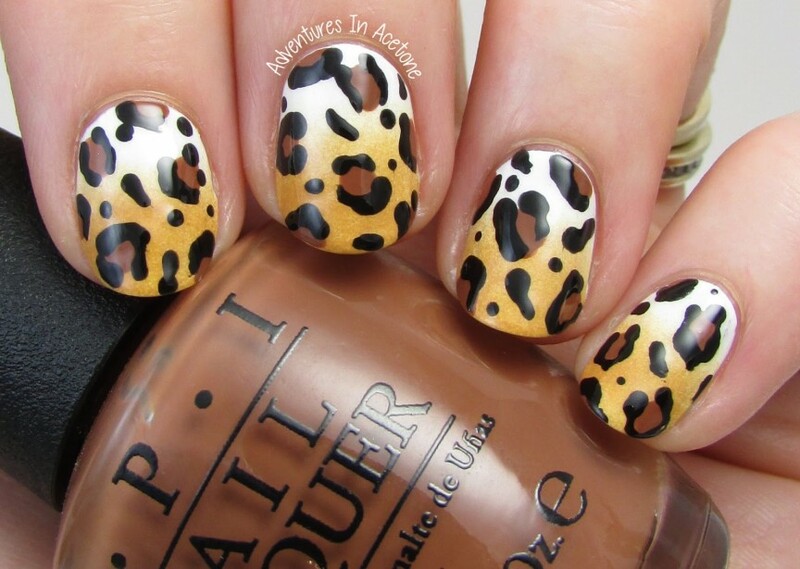 so pretty – and totally true, whenever I do animal print I go for crazy colors. This looks so real! The background gradient looks too cool! Love! I tried leopard and they made it into my FAIL pile. These are GREAT! I love these. The execution is perfect and the colors complement each other perfectly. I love the gradient under the print! Looks amazing! So beautiful…gradient + leopard…two of my favorites! I love the gradient with the leopard print, it really makes this more naturalistic for me. These are gorgeous. I'm definitely going to buy this book as soon as possible. Thanks for sharing your ideas and inspiring us all to try new ideas.